I got invited to give a short keynote presentation during the Cloud Connect conference this week at the Santa Clara Convention Center (thanks Shlomo and Alistair). Here are the slides (as PPT and PDF). They are visual support for my bad jokes rather than a medium for the actual message. So here is an annotated version. I used this first slide (a compilation of representations of the 3-layer Cloud stack) to poke some fun at this ubiquitous model of the Cloud architecture. Like all models, it’s neither true nor false. It’s just more or less useful to tackle a given task. 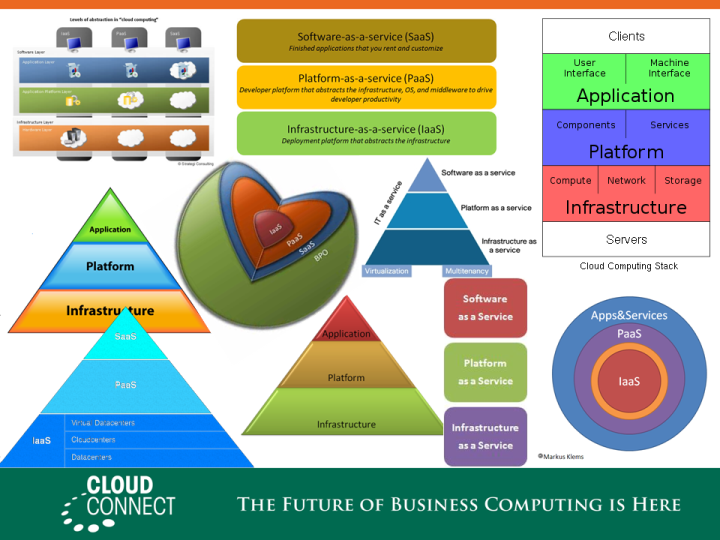 While this 3-layer stack can be relevant in the context of discussing economic aspects of Cloud Computing (e.g. Opex vs. Capex in an on-demand world), it is useless and even misleading in the context of some more actionable topics for SaaS: chiefly, how you deliver such services, how you consume them and how you manage them. In those contexts, you shouldn’t let yourself get too distracted by the “aaS” aspect of SaaS and focus on what it really is. Which is… a web application (by which I include both HTML access for humans and programmatic access via APIs.). To illustrate this point, I summarized the content of this blog entry. No need to repeat it here. The bottom line is that any distinction between SaaS and POWA (Plain Old Web Applications) is at worst arbitrary and at best concerned with the business relationship between the provider and the consumer rather than technical aspects of the application. … guillotine slide. Which is probably the only thing people will remember from the presentation, based on the ample feedback I got about it. It probably didn’t hurt that I also made fun of my country of origin (you can never go wrong making fun of France), saying that the guillotine was our preferred way of solving any problem and also the last reliable piece of technology invented in France (no customer has ever come back to complain). Plus, enough people in the audience seemed to share my lassitude with the 3-layer Cloud stack to find its beheading cathartic. Come to think about it, there are more similarities. 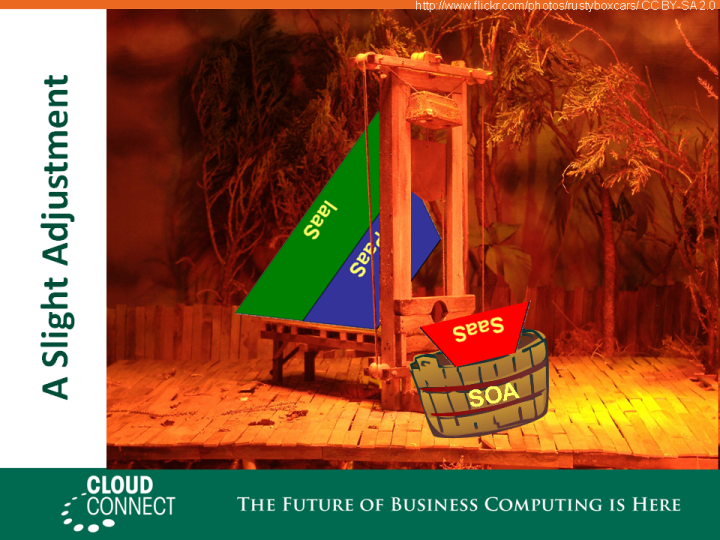 The guillotine is to the axe what Cloud Computing is to traditional IT. So I may use it again in Cloud presentations. Of course this beheading is a bit excessive. 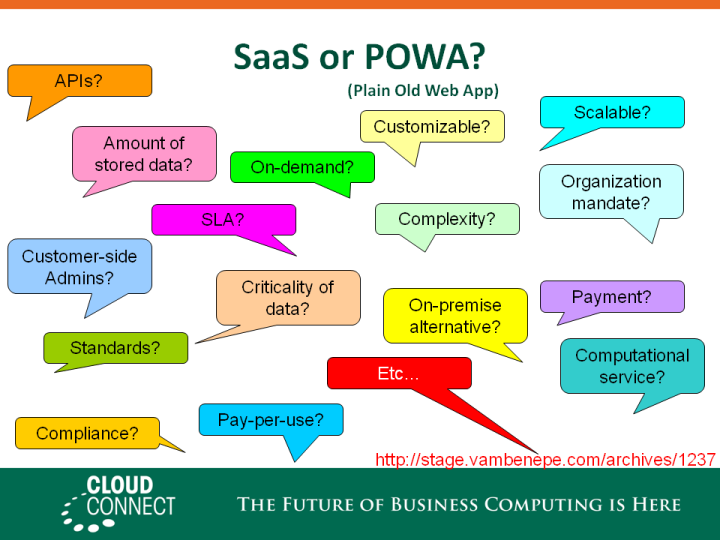 There are some aspects for which the IaaS/PaaS/SaaS continuum makes sense, e.g. around security and compliance. In areas related to multi-tenancy and the delegation of control to a third party, etc. To the extent that these concerns can be addressed consistently across the Cloud stack they should be. But focusing on these “Cloud” aspects of SaaS is missing the forest for the tree. A large part of the Cloud value proposition is increased flexibility. At the infrastructure level, being able to provision a server in minutes rather than days or weeks, being able to turn one off and instantly stop paying for it, are huge gains in flexibility. It doesn’t work quite that way at the application level. You rarely have 500 new employees joining overnight who need to have their email and CRM accounts provisioned. This is not to minimize the difficulties of deploying and scaling individual applications (any improvement is welcome on this). But those difficulties are not what is crippling the ability of IT to respond to business needs. Rather, at the application level, the true measure of flexibility is the control you maintain on your business processes and their orchestration across applications. How empowered (or scared) you are to change them (either because you want to, e.g. entering a new business, or because you have to, e.g. a new law). How well your enterprise architecture has been defined and implemented. How much visibility you have into the transactions going through your business applications. It’s about dealing with composite applications, whether or not its components are on-premise or “in the Cloud”. Even applications like Salesforce.com see a large number of invocations from their APIs rather than their HTML front-end. Which means that there are some business applications calling them (either other SaaS, custom applications or packaged applications with an integration to Salesforce). Which means that the actual business transactions go across a composite system and have to be managed as such, independently of the deployment model of each participating application. At this point I launched into a very short summary of the benefits of SOA governance/management, real user experience monitoring, BTM and application-centric IT management in general. Which is very succinctly summarized on the slide by the “SOA” label on the receiving bucket. I would have needed another 10 minutes to do this subject justice. Maybe at Cloud Connect 2011? Alistair? 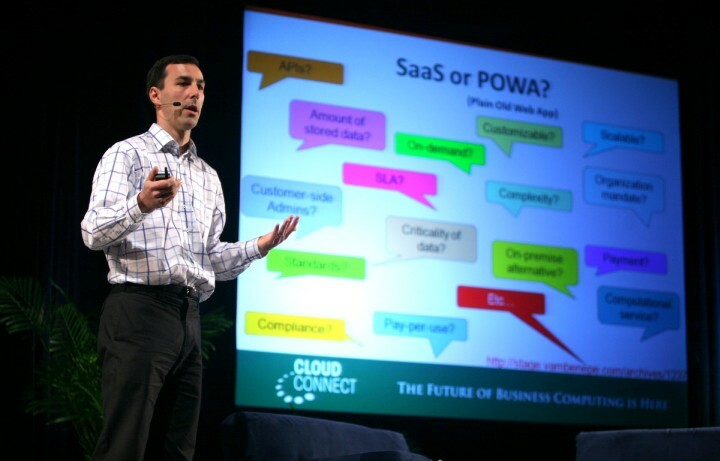 This picture of me giving the presentation at Cloud Connect is the work of Alex Dunne. The guillotine picture is the work of Rusty Boxcars who didn’t just take the photo but apparently built the model (yes it’s a small-size model, look closely). Here it is in its original, unedited, glory. My edited version is available under the same CC license to anyone who wants to grab it. Is Business Process Execution the killer app for PaaS? Have you noticed the slow build-up of business process engines available “as a service”? Force.com recently introduced a “Visual Process Manager”. Amazon is looking for product managers to help customers “securely compos[e] processes using capabilities from all parts of their organization as well as those outside their organization, including existing legacy applications, long-running activities, human interactions, cloud services, or even complex processes provided by business partners”. I’ve read somewhere (can’t find a link right now) that WSO2 was planning to make its Business Process Server available as a Cloud service. I haven’t tracked Azure very closely, but I expect AppFabric to soon support a BizTalk-like process engine. And I wouldn’t be surprised if VMWare decided to make an acquisition in the area of business process execution. Attacking PaaS from the business process angle is counter-intuitive. Rather, isn’t the obvious low-hanging fruit for PaaS a simple synchronous HTTP request handler (e.g. a servlet or its Python, Ruby, etc equivalent)? Which is what Google App Engine (GAE) and Heroku mainly provide. GAE almost defined PaaS as a category in the same way that Amazon EC2 defined IaaS. The expectation that a CGI or servlet-like container naturally precedes a business process engine is also reinforced by the history of middleware stacks. Simple HTTP request-response is the first thing that gets defined (the first version of the servlet package was java.servlet. * since it even predates javax), the first thing that gets standardized (JSR 53: servlet 2.3 and JSP 1.2) and the first thing that gets widely commoditized (e.g. Apache Tomcat). Rather than a core part of the middleware stack, business process engines (BPEL and the like) are typically thought of as a more “advanced” or “enterprise” capability, one that come later, as part of the extended middleware stack. But nothing says it has to be that way. If you think about it a bit longer, there are some reasons why business process execution might actually be a more logical beach head for PaaS than simple HTTP request handlers. Architecturally, the contract between a business process engine and the deployed entities (process definitions) is much smaller than the contract of a GAE-style HTTP handler. Those GAE contracts include an entire programming language and lots of libraries. A BPEL container, on the other hand, has a simple contract. It’s documented in one specification (plus a few dependencies) and offers basic activities like routing logic, message correlation, simple data manipulation, compensation handlers and service invocation. You may not think of BPEL as “simple” but would you rather implement a BPEL engine or a complete Python interpreter along with most of the core libraries? I thought so. That’s what I mean by a simpler (narrower) contract. And BPEL is just one example, I suspect some PaaS platforms will take a more bare-bone approach (e.g. no “scopes”). Just like “good fences make good neighbors”, small contracts make good Cloud services. When your container only interprets a business process definition (typically an XML document), you don’t need to worry about intercepting/preventing all the nasty low-level APIs (e.g. unfettered network access, filesystem reads, OS calls…) that are not acceptable in a PaaS situation. But that is what Google had to do in the process of pairing down a general-purpose programming language to fit into the constraints of a PaaS container. There is no intrinsic reason why a synchronous HTTP request handler has to have access to image-manipulation libraries and a business process handler doesn’t. But the use cases tend to push you in that direction and the expectations have been set. As a result, a business process engine is architecturally a better candidate for being delivered as a Cloud service. Practically speaking, it is pretty easy today to get a (synchronous) Web app framework up and running “in the Cloud”. Provisioning a Django, PHP, RoR or Tomcat (plus the Java framework of your choice) stack on EC2 is a well-traveled path. Even auto-scaling these things is pretty well understood. I am the first one to scream that “here is an AMI of our server stack” is *not* the same as PaaS, but truth be told many people are happy enough with it. As a result, the benefit of going from a “web app on IaaS” situation to GAE-like situation is not perceived as very compelling. I suspect the realization may hit later, but for now people are happy to trade the simplified administration and extra scalability of PaaS for the ability to keep their current framework (MySQL and all) unchanged. There is no fundamental reason why you can’t run a business process engine on top of an IaaS-provisioned infrastructure. It’s just that you are mostly on your own at this point. Even if you find an existing public AMI that meets your needs, I doubt you’ll find a well-tested way to manage, backup and auto-scale this system (marrying IaaS-level invocations with container-level and DB-level tasks). Or if you do it will probably cost you. In that “new frontier” context, a true PaaS alternative to the “build it on top of IaaS” approach is a lot more compelling than if all you need is yet another RoR-on-EC2 system. When deciding whether to walk back to your hotel after dinner or take a cab, you don’t just consider the distance. How familiar you are with the neighborhood and how safe it appears are also important parameters. This may not be obvious to people who come to PaaS from a Web application framework perspective, but there is a large market for business process engines in enterprise integration scenarios. Whether it’s Oracle Fusion Middleware, Microsoft BizTalk, webMethods (now Software AG) or others, this is a very common and useful tool in the enterprise computing toolbox. If this is the market you are after (rather than creating Facebook apps or the next Twitter), then you have to address this need. Not to mention that business processes engines are often used for partner integration scenarios (which makes hosting in a public Cloud a natural choice). In the end, both synchronous and asynchronous execution engines are useful, as are other core services like storage (here is my proposed list of PaaS container types). I just wanted to bring some attention to business process execution because I think PaaS is the context in which its profile will rise to higher prominence. I also anticipate that this rise will lead to some very interesting progress and innovation in the way these processes are defined, deployed and managed. We haven’t yet seen, in this area, the relentless evolutionary pressure that has shaped today’s synchronous Web application frameworks. Fun times ahead. PaaS as the path to MDA? Lots of communities think of Cloud Computing as the realization of a vision that they have been pusuing for a while (“sure we didn’t call it Cloud back then but…”). Just ask the Grid folks, the dynamic data center folks (DCML, IBM’s “Autonomic Computing”, HP’s “Adaptive Enterprise”, Microsoft’s DSI), the ASP community, and those of us who toiled on what was going to be the SOAP-based management stack for all IT (e.g. my HP colleagues and I can selectively quote mentions of “adaptation mechanisms like resource reservation, allocation/de-allocation” and “management as a service” in this WSMF white paper from 2003 to portray WSMF as a precursor to all the Cloud APIs of today). I thought of another such community today, as I ran into older OMG specifications: the Model-Driven Architecture (MDA) community. I have no idea what people in this community actually think of Cloud Computing, but it seems to me that PaaS is a chance to come close to part of their vision. For two reasons: PaaS makes it easier and more rewarding, all at the same time, to practice model-driven design. More bang for less buck. My understanding of the MDA value proposition is that it would allow you to create a high-level design (at the level of something like an augmented version of UML) and have it automatically turn into executable code (e.g. that can run in a JEE or .NET container). I am probably making it sound more naive than it really is, but not by much. That’s a might wide gap to bridge, for QVT and friends, from UMLish to byte-code and it’s no surprise that the practical benefits of MDA are still to be seen (to put it kindly). In a PaaS/SaaS world, on the other hand, you are mapping to something that is higher level than byte code. Depending on what types of PaaS containers you envision, some of the abstractions provided by these containers (e.g. business process execution, event processing) are a lot closer to the concepts manipulated in your PIM (Platform-independent model, the UMLish mentioned above). Thus a smaller gap to bridge and a better chance of it being automagical. Especially if you add a few SaaS building blocks to the mix. Not only should it be easier to map a PIM to a PaaS deployment environments, the benefits you get once you are done are incommensurably greater. Rather than getting a dump of opaque auto-generated byte-code running in a regular JVM/CLR, you get an environments in which the design concepts (actors/services, process, rules, events) and the business model elements are first class citizens of the platform management infrastructure. So that you can monitor and set policies on the same things that you manipulate in you PIM. As opposed to falling down to the lowest common denominator of CPU/memory metrics. Or, god forbid, trying to diagnose/optimize machine-generated code. I wasn’t thinking of Microsoft SQL Server Modeling (previously known as Oslo) when I wrote this, but Doug Purdy’s tweet made the connection for me. And indeed, one can see in SQLSM+Azure the leading candidate today to realizing the MDA vision… minus the OMG MDA specifications. It doesn’t look like much. But it’s an major step for application-driven IT management (and eventually BSM). Take a SCA component. Follow the SCA-defined component-to-composite and service-to-reference relationships upwards and eventually you’ll get to top level application services that have a decent chance of mapping well to business-relevant activities (e.g. order processing). Which means that the metrics of these services (e.g. availability, response time) are likely to be meaningful and important to the line of business. Follow the same SCA relationships downward and you’ll end up (in a SCA-based infrastructure like Oracle SOA Suite 11G), with target components that are meaningful to the IT administrator. Which means that their metrics and configuration settings (like “inMemoryOptimization”) are tracked and controlled by IT. You now have a direct string of connections between this configuration setting and a business relevant metric. You can navigate the connection in both directions: downward/reactive (“my service just went down, what changed in the infrastructure”) versus upward/proactive (“my service is always slow, what can I do to optimize the execution”). Of course these examples are over-simplistic (and the title of this post is a bit too lyrical, on account of this). Following these SCA relationships in brute-force fashion will yield tens of thousands of low-level configuration settings for any top-level service, with widely differing importance and impact (not to mention that they interact). You need rules to make sense of this. Plus, configuration-based models are a complement to runtime transaction discovery, not a replacement (unless your model of the application includes every single line of code). But it’s not that often that you can see a missing link snap into place that clearly. What this shows is the emergence of a common set of entities between the developer’s model and the IT admin model. And if the application was developed correctly, some of the entities in the developer’s model correspond to entities in the mental model of the application user and the line of business manager. SCA is the skeleton for this. Attaching configuration to SCA components puts muscle on the bone. The road to BSM is paved with small improvements in the semantic alignment between IT infrastructure and application services. A couple of years ago, I tried to explain why SCA is very relevant for IT management. Now we can see it. A lot of attention has been focused on technical standards for Cloud computing, especially over the last month (e.g. DMTF incubator announcement). That’s fine, but before we go crazy with detailed technical standards let’s realize that for Cloud computing (of the public variety at least) to take off we’ll need just as much standardization of non-technical interactions. Namely processes. This, to me, is one of the most interesting angles on the recent announcement by Amazon AWS that they now support (in limited beta) the ability to load data from storage that is physically shipped to them. Have a look at this announcement and you’ll notice that it spends more time describing a logistical process (how to pack, how to ship…) than technical interfaces (storage device requirements, how to create a manifest…). It is still part of the “AWS Developer Guide” but clearly these instructions are not just for developers. Many more such processes need to be “standardized” (or at least documented) for companies to efficiently be able to use public Clouds (and to some extent even private Clouds). Let’s take SLAs as an example. It sounds good when a Cloud provider says “we offer SLAs”. But what does it mean? Does it mean “we advertise some SLA numbers, you’re responsible for contacting us (trough a phone number hidden somewhere on our site) when you think we’ve violated them; if we agree with your measurements then you may get a check in the mail at some point in the future”? Not so useful. If, on the other hand, there is a clear definition of the metric that the SLA applies to, a clear definition of how it gets measured (do we trust provider performance reports, customer measurement, a third party monitor…), a clear process to claim refund, a clear process to actually provide the refund (credit for future service or direct payment, when/how is the payment made…), then it becomes more useful. I picked the SLA enforcement example because it happens to be an area that the TMF (TeleManagement Forum) has made partially available as a teaser for its eTOM business process framework (aimed at telco providers). The full list of eTOM processes is only available to paying subscribers. One of the goals of the eTOM process framework is “to simplify procurement, serving as a common language between service providers and suppliers”. Another way to say it is that eTOM “recognizes that the enterprise interacts with external parties, and that the enterprise may need to interact with process flows defined by external parties, as in ebusiness interactions”. Exactly what we are talking about when it comes to making public Clouds easily consumable by enterprises. SLA management is just one small part of the overall eTOM framework (if you look for it in this eTOM overview poster it’s in purple, under “assurance”, in the first row). My point is not to assert that Cloud providers should adopt eTOM. Nobody adopts eTOM directly as a blueprint anyway. But, while the cultures and maturity levels are sometimes different, it is also hard to argue that Cloud providers have nothing to learn form telco providers (many of which are becoming Cloud providers themselves). I shudder at the idea of AT&T teaching another company how to handle customer service, but have you ever tried to call Google? Readers of this blog are likely to be more familiar with ITIL than eTOM (who, incidentally, incorporates parts of ITIL in its latest version, 8.0). For those who don’t know about either, one way to think about it is that Cloud providers would implement processes that look somewhat like eTOM processes, that Cloud consumers implement IT management processes that follow to some extent ITIL best practices and that these two sets of processes need to meet for public Clouds to work. I touched on this a few months ago, when I commented on the incorporation of Cloud services in an IT service catalog. My main point is not about ITIL or eTOM. It’s simply that there are important process aspects to delivering/consuming Cloud services and that they have so far been overshadowed by the technical aspects. The processes sketched in the AWS import/export capability represent the first drop of an upcoming shower. The mini-scandal of last week was the manifesto-gate. The mini-scandal of this week is shaping out to be the Ulitzer-gate (if you want to make sure not to miss next week’s IT scandal, subscribe to the Register feed, ferreting these out and adding a bass-heavy soundtrack is their specialty). Turns out I am one of these Ulitzer “unaware authors” through two articles I wrote a while ago for the Web services Journal, a paper publication by Sys-con (based on a request from HP PR) and a blog post I allowed Sys-con to republish. Looks like Ulitzer and Sys-con are one and the same. Three articles, spaced two years apart. That’s enough to earn me a dedicated home page at Ulitzer and a rank of 1,000 among their more than 6,000 authors. Makes you wonder how much the 5,000 “authors” behind me have (unknowingly) produced… Whatever. At least it’s all content that I authorized Sys-con to use, not something that was lifted from my blog as apparently happened to others. Sure it has a lot more emphasis on WS-* specs than is compatible with the current zeitgeist, and it uses the now-obsolete term of “utility computing” rather than the nebulous alternative currently en vogue, but isn’t the main message there? Just to be clear, I am not laying pretentious claims of prescience and vision (at least not in this entry). There are plenty of documents (e.g. from the Grid community) that make the same points in more eloquent terms and starting many years prior. It’s just fun to see this link from today’s scandal to the one from last week. Enterprise services are created by combining infrastructure services, applications, and business processes. To be able to adapt quickly to business changes, enterprise IT must evolve from management of individual resources to management of interrelated services. This will be achieved through the development of composable and modular standards that expose the management capabilities of the building blocks of enterprise services. The Web services platform is an enabler of this transformation: a Web services-based management infrastructure provides a channel that is appropriate for dynamic resource provisioning, allocation, and configuration – often called utility computing. We can consider this management infrastructure as a four-layered architecture. Starting at the foundation layer, the work on the base Web services infrastructure is far from over. First, until WSDL 2.0 is widely deployed, designers have to compose around the deficiencies of WSDL 1.1, such as the lack of portType inheritance. Second, there is still no standard for referencing Web services. Finally, key specifications such as WSRF (Web Services Resource Framework) and WSN (Web Services Notification), without which people were left to reinvent Web services interfaces to access stateful resources, have only recently reached the standards community. These issues are being resolved and a set of building blocks for accessing resources through an SOA (service-oriented architecture) is shaping up. It is critical that these building blocks be modular and composable to allow incremental adoption and separation of concerns. Moving from the foundation to the management protocol layer, the OASIS WSDM (Web Services Distributed Management) technical committee, through its MUWS (Management Using Web Services) specification, is the key articulation point between the base Web services architecture and utility computing. Both the IT management community and the Grid community rely on MUWS. It defines how to express and exercise manageability capabilities through Web services, putting in place a management channel that is more interoperable and accessible than ever before. Next is the modeling layer. Information models need to be composed so that a service can be represented based on the services that it is assembled from, be they peer or infrastructure services. Since these will be described by different models, the management channel (MUWS) needs to be model-agnostic in order to support a model-centric architecture. For example, CIM (Common Information Model) is a model that focuses on concrete resources. The DMTF WS-CIM subgroup must now open CIM to the Web services platform by developing a standard way to expose CIM-modeled resources through MUWS. Other models provide representations for service security, service-level agreements (SLA), etc. Only by composing these models will, for example, an auction service SLA be adequately managed as it depends on a combination of the performance of the servers on which the service runs, the application server that hosts it, the other services (authentication, billing, etc.) that it makes use of, and the business process engine that controls the bidding. Once this model-centric architecture is in place, management actions can be policy-driven through explicit constraints. Finally, at the top layer, the architecture includes a set of common services for utility computing. They are being defined collaboratively by DMTF (Utility Computing working group) and GGF (OGSA working group). All the pieces are falling into place but much remains to be done to allow comprehensive management of enterprise services in a model-centric way through Web services standards. While it would be easier to develop an end-to-end model specific to one company’s offering, standardization allows the integration of the management capabilities of all the components that compose enterprise services. We must keep the pressure on vendors to deliver modular and composable specifications (for format, function, and protocol) that expose management capabilities of infrastructure services, applications, and business processes in such a way that these capabilities can be composed by the next generation of management applications. These applications will use this to synchronize business and IT and to capitalize on change. Microsoft’s PDC is taking place this week and more details were shared with the attendees about project Oslo, an effort announced last year to drastically improve the use of models across the application lifecycle. Some code is available (I think the Quadrant code is only for PDC attendees but the Oslo SDK is available to everyone). I am not at PDC, I didn’t see any presentation and I didn’t download any code. But Microsoft has also posted technical details on MSDN and, as far as I am concerned, that’s the most time-effective way to spend a couple of hours learning about Oslo. BTW, the way they share these early design descriptions and accept to make their evolution public is admirable. For those who only want to spend 10 minutes rather than 2 hours, here are the thoughts that came to my mind as I was reading. Overall I am somewhat underwhelmed, but not necessarily in a bad way. I know that’s a little schizophrenic so let me explain. After hearing a lot about how Oslo was the next big thing in modeling, it is a little surprising to read a document that can be summarized as “modeling is good, so go create some SQL tables and store them in a RDBMS”. That’s the underwhelming part. But on the other hand, it is more down to earth and practically-minded than I feared. And this is just a summary, in truth there is more than just “use SQL”. Half of the MSDN documentation basically explains how to use SQL Server to store application models (as of today, the “Developing Models for the Metadata Store” section has only one sub-section, “SQL Server Guidelines for Modeling in the Oslo Repository“). Does this mean that all .NET applications will eventually have to carry with them a deployment of SQL Server 2008 even if they don’t use it to store the their operational data? Sure there are a few extra repository services (e.g. finer-grained change auditing) but most Oslo repository services are generic SQL Server features. That section has quite a lot of T-SQL, but it’s pretty readable. It also has a lot of dependencies on following naming conventions which makes me think that directly creating T-SQL code is not the best approach. Fortunately there is an alternative, the “M” language. It’s a schema language with a built-in constraint mechanism. I found it more data-oriented (as opposed to resource-oriented) than I expected. Even though “each model is really a set of data structures, relationships, and constraints in serialized form“, there is a lot more support for data structures and constraints than for relationships. It’s just a foreign key. Relationships aren’t items and don’t have any property (or “field” as they’re called in “M”). For example, the relationship between a student’s enrollment record and a given class can’t have, as property, the grade that the student got for that class (as in the example in section 4.1.4 of the second LC of SML). To model this in “M” you need to create another item (e.g. “courseEnrollment”) and have a relationship from the student to that item and another one from that item to the “course” item itself. Or to replace the foreign key in the student table with a complex structure that contains both the foreign key and the properties of the relationship. At the end it has the same expressiveness potential, but in a less streamlined form. I assume Microsoft took this approach for performance reasons. I am going on a limb here, but it may also be a difference between development-time concerns and operation-time concerns. During development (all the way to testing and packaging), you can still mostly get away with a relatively simple containment structure. You care about the components of your application and how they are packaged inside or next to one another. Sure you care about who calls who outside of the deployment unit but that’s not as core a concern as getting your class dependencies right, your tests in order and your installer configured. In fact, some of the “who calls who” bindings will be only be realized at runtime. Oslo, at least so far, clearly seems more focused on development time than operations so support for a relationship-rich model may not seem critical. At operations time, on the other hand, you don’t really care so much about how things were packaged before installation. You care a lot more about who invokes who (especially for modern distributed applications), what the network layout is, what resources a ticket is attached to, etc. The model looks a lot more like a graph with complex relationships. Something that “M” doesn’t seem ideally suited for. Except for this caveat, I like “M”. It’s not anti-XML (you can represent values as XML if you’d like) but it avoids the “the answer is XML/XSD what is the question” approach to modeling that is sometimes a little too prevalent. “M” is a much better schema language for IT systems than XSD. I especially like its approach to types. A value is not intrinsically of a given type. A type is a condition that you happen to meet or not at the current time (“take heart little field, you can be anything you want when you grow up”). As such, you can be of several types at the same time. Refined types are potatoes inside potatoes (not sure if “M” supports definition of types as unions and/or intersection of existing types, for intersection I want to write something like”type NewType : OldType1 where this in OldType2” but there is no “this” in “M”). That approach to types (and the way constraints leverage types) is reminiscent of RDF/OWL. It’s a classification more than a typification, but I understand why they didn’t want to call it “class”. The similarities with RDF/OWL don’t go any further. As I wrote earlier, “M”is very data-focused and not resource-focused: as far as I can tell “M” types are defined syntactically, not semantically (the semantics come as a consequence). For example, I don’t think that you can assert that a given item representing a person is of type “friendly” if there is no corresponding data in the item. You’d have to first create a boolean field called “friendly” and define that those that have that field set to “true” are of type “friendly”. Unlike in RDF/OWL where you can just assert that a subject is “friendly”. Here is another reason why you can’t have “semantics-only” types: “if you do not specify the type of a field or value, M infers a type for it“. Two things don’t sound quite right to me here. First a detail: the sentence (like others in the doc) talks about “the” type of a field of value, while there can be more than one. More importantly, what’s the point of this feature? How does it help me to have my IRC nickname classified as a post code or as a password just because it happens to be made of a compatible combination of letters and numbers? Maybe it makes sense as a storage optimization, but why does it make sense to expose this to the user? I also like the way “extents” work. The current description of that feature is pretty limited, but based on how it is used in other parts I think one of its usages is to support a non-OO equivalent to inheritance: create two extents, one for the “superclass” and one for the “subclass” where each only contains the properties/fields defined at that level. You should get both of them in order to have the full picture (all the fields). This is, if I understand it correctly, similar to something I have been (unsuccessfully so far because “XML doesn’t do it this way”) trying to sell to the DMTF CMDBf working group: model inheritance through a set of non-overlapping records rather than dealing with a type hierarchy on record types. It’s not just that it makes relational storage easier (even though it does and that’s probably why “M” does it this way), it also makes your query/select operations a lot easier to specify and implement. All in all (and without having gone through the exercise of defining actual models in “M”), it seems like a fine schema language (except that its dependency on the CLR base types is unpractical for users outside of the Microsoft universe) but I am not sure if it is beefy enough to be a good IT management metamodel. When the document says that “the Oslo repository provides open and flexible access to the data it contains, which enables direct access to SQL Server views of the underlying data. There are no complex data access layers or APIs” it sounds better than saying “it’s just SQL, so map your model to it and if you want relationships or type inheritance just build it on top of it and quit whining”. But it is an admission of limitation at the same time as a claim of simplicity. I also smell an assumption that LINQ will provide enough hand-holding that non-SQL-savvy developers will be ok. We’ll see. And then there is MGrammar. Things get a little confusing at that point if you try to relate MGrammar to “M”. Actually, the FAQ states that “the M language consists of three parts: MGraph, MSchema and MGrammar“. This came a bit as a surprise to me since at that point I had finished reading (not in details but not too quickly either) the “M” documentation and I hadn’t seen these names mentioned once. Looks like there is some documentation consistency issues here, but that’s hardly surprising considering this is a “hyper-early (pre-alpha)” release as Doug Purdy puts it. I think that everything that I have referred to as “M” above is MSchema. MGrammar is something different altogether: it’s the source of the Domain Specific Language (DSL) references we’ve been hearing in relationship with Oslo. Technically, MGrammar is a BNF on steroids plus an automatically generated parser for your syntax. Cute. I assume that “M” (i.e. MSchema) is built as MGrammar-defined DSL but I am not sure why I would care. I am all for reuse and if someone at Microsoft thought that there was something reusable in the way they defined MSchema then it’s a good thing to expose this tool. But where does it come into play in application modeling? The last thing I want is people inventing completely independent languages to describe different domains. I am all for specialization, but a common underlying metamodel is pretty nice when you have to make sense of a whole system. I don’t see any such commonality in MGrammar: as far as I can tell it can be used to define anything from PostScript to sonnets. From the FAQ, the connection point between MGrammar and MSchema is MGraph (MGrammar languages are parsed into an MGraph, MSchema “builds on MGraph”). That’s nice, but since neither the MSchema nor the MGrammar documentation mention MGraph I don’t really know what to make of this. David Chappell’s white paper also mentions MSchema and MGrammar but not MGraph. The introduction to the MGrammar Language Specification states that “the data that results from Mg [a.k.a. MGrammar] processing is compatible with Mg’s sister language, The Oslo Modeling Language, M, which provides a SQL-compatible schema and query language that can be used to further process the underlying information“. Compatible? I need more information here. In any case, MGrammar sounds like a fun project for a techie. Who am I to deny Microsoft engineers their fun. Jokes aside, I am probably missing something here seeing how prevalent the DSL message is in all discussions of Oslo. Look at the “highlights of this book” section for the upcoming Oslo/M book from the creators of the “M” language: half of it is about the DSL support and there must be a reason beyond pure geekery. As a side note, if you buy this book you need to understand what little shelf life it will have (I can give you a good price on a lightly-used Hailstorm/”.Net my services” specification book). Aside from the “M” language itself, there are a few models described in the documentation. One corresponds to BPMN (actually, it says that it “closely aligns with” BPPMN 1.1, does this imply that they are not quite the same?). The fact that this model supports imports from Visio is a nice feature. The Application model (one of the places where you can see “extents” in action) scares me a little bit because I doubt that two different people would use the same “extents” to describe the same software elements. Unless of course that’s being done for them by a pre-defined mapping to their development framework (.NET) enacted by their common development tool (Visual Studio). Which may be the assumption. Yet, the Application model is defined in generic terms, not Microsoft-specific (with a couple of slip-ups, like a WebApplicationModule being defined as a “Web application (module) implemented by IIS or WAS“. Maybe I’ll feel better about the generic applicability of this Application model when I see a full-fledged description (e.g. including relationship semantics as captured in foreign key field names) and an example. At the bottom of that Application model, there is a lonely “Manageable” type to use if you have a LifecycleState field. This reinforces my impression that despite the claims to link development time with operational time, a lot of the focus to date has been on the former rather than the latter. The ServiceModel model will look familiar to people familiar with SCA and is presumably complementary to the WorkflowModel and WorkflowServiceModel models, both of which are directly mapped to Windows Workflow Foundation. I guess that’s where Oslo and Dublin touch one another. I am still glad they are now clearly separated. There is also a “Quadrant” model which concerns me a bit (it seems to be used to store customization of the Quadrant UI which, while convenient to store straight in the repository, doesn’t strike me as necessarily belonging there). At this point, the question is not whether Microsoft can build Oslo as it is currently defined. SQL Server 2008 already exists, the usage guidelines aren’t unrealistic and even the “M-to-T-SQL” translation doesn’t seem too hard for Microsoft to implement (the SDK presumable already contains an implementation). I have no doubt they can deliver the system they describe. What I don’t know is whether and how it will be actually useful. Describing “M” in details is good. Describing how the repository is implemented on top of SQL Server 2008 is interesting but not so relevant. What I’d like to see is a description of how all this gets used. How does it change the Visual Studio experience? How does it change the installation process/format? How does it support round-tripping between lifecycle stages (e.g. if the developer changes the workflow model, does that original BPMN model get consequently updated)? How does it relate to SLAs and policies? How does it apply to application monitoring? How does it apply to configuration management, to the change process? Etc. In short, what’s the Oslo ecosystem going to be. These questions aren’t completely ignored in the MSDN documentation, but they are dispensed with in a couple of pages: “Application Development and Lifecycle Improvements” and “IT Operations Benefits“. The former states, for example, that “having the Oslo repository act as a central location for these models also enables a connection between the design and implementation models. This connection helps prevent these models from becoming disconnected during the development process“. Which all sounds good but is just a set of assertions that we have heard many times before (not just from Microsoft). How do “M” and the Oslo repository really make this true? On the “IT Operations Benefits” side, things are equally blurry: “the Oslo repository can store all types of machine and application configuration data. When consistently updated, this configuration data is a catalog of the current state of all monitored machines and applications in the environment“. Notice the “when consistently updated” hand wave. That’s kind of the crux if you really want to manage across the lifecycle. How will they achieve this consistency? By centralizing all changes through a model-driven controller a la SDM/SML? Through ongoing discovery and/or change notifications? By relying on good old ITIL/MOF processes? The FAQ declares that “having a common approach does not necessarily correlate to one physical store, but more of a federated model and we believe that some of the new Repository, along with existing investments in both Configuration Management Database (CMDB) and Team Foundation Server (TFS), will form the foundation for a common Microsoft metadata strategy and should be supported across our set of products“. OK, but who is the source of truth for application configuration data? The Oslo repository or the CMDB? Is one the desired state and the other the observed state? Does the CMDB go back to simply being a Service Desk (and if so, does the Oslo repository take on the responsibility to enforce change processes, something that requires more than the security model in Oslo)? If the CMDB is still going to use SML as its metamodel, how do you efficiently federate across such different metamodels as SML (i.e. XSD + schematron + relationships) and “M”? Lots of questions remaining. What will Oslo have turned into in a few years? A business process design/implementation/monitoring suite (there is a strong workflow feel to many parts)? A generic drag-and-drop programming environment (“the fact that entire features are already described by models means that for a wide array of application and component categories you can start using visual tools to design and implement your components“)? A control center for end to end application management? All of the above? Nothing? This was just a quick brain dump after reading the documents. Actually, I just realized it somehow got pretty long (congrats if you’re still reading). I hope this post is not too disorganized. Oslo is an interesting effort, but, as Microsoft is first to admit, it’s at a very early stage. I am just surprised that this first release spends so much time on the “how” rather than the “what”. Maybe it’s just because I only got my information from the MSDN documentation. We’ll see when more content from PDC finds its way online. I just want the slides, watching recorded presentations is rarely time-efficient (and you can expect them to require Silverlight). Speaking of Silverlight, there is this new site on Oslo if you think watching some videos is worth installing Silverlight. Those screenshots don’t motivate me sufficiently. Tom Baeyens (leader of JBoss jBPM) recently wrote a DZone article titled “Seven Forms of Business Process Management With JBoss jBPM”. It’s an interesting article. It does a good job of illustrating the difference between using BPM tools to capture/communicate business intent versus using them to implement asynchronous interactions, especially with Web services. While it is very much worth reading, the article is not a good reference document for defining/explaining BPM, because it is much to tied to the jBPM product. This happens in two ways, one harmless and one more consequential. The harmless tie-in is that each flavor of BPM comes with a description of the corresponding jBPM features. Not something you want to see in a generic reference document but Tom is very upfront about the fact that the article is going to cover the jBPM product (it’s even in the title) and about his affiliation with jBPM. No problem there. What bothers me more is a distinct feeling that the choice of these seven use cases is mainly driven by the availability of these supporting jBPM features. It’s not just that the use cases are illustrated through jBPM features. What we are seeing is the meaning of BPM being redefined to match exactly what jBPM offers. The most egregious example is use case 6, “thread control language”. Yes, threads are hard. It sounds like Tom and team are planning to make this easier by adding some Erlang-like features in jBPM (at this point the tense changes to future “we’ll develop a thread control language…” so there isn’t much specifics). Great. Sounds interesting, I am looking forward to seeing it. But if this is BPM then are threads a BPM features of the various programming languages? Are OS processes a BPM feature? Are multicore CPUs part of BPM while we’re at it? Use cases 5 (“visual programming”) and 7 (“easy creation of DSLs”) are treading in the same waters. I have the feeling that if jBPM was able to synchronize the podcasts on my MP3 player, we would have had an 8th use case for BPM. Tom is right to write that “the term BPM is highly overloaded and used for many different things resulting in a lot of confusion”. By adding a few more use cases that nobody, as far as I know, had previously attached to the BPM bandwagon, he is creating more, not less, confusion. This is especially glaring if you notice that one of the most important BPM use cases, monitoring, is not even mentioned. Maybe it’s just me and my “operations time” bias versus Tom’s “development time” bias. But it seems that he is pulling the BPM blanket a bit far towards his side of the bed (don’t read too much in the analogy, I have never met Tom). Rather than saying that “these use cases give concrete descriptions for the different interpretations of the term BPM”, it would be more accurate to say “these use case give concrete descriptions for some of the different interpretations of the term BPM, ignore others and add a few new ones”. I didn’t learn a lot about BPM, but the article did make me interested in learning more about jBPM, which is probably its primary objective. There seem to be some interesting design goals towards providing a flexible set of orchestration-related tools to application developers. Some of it reminds me of the workflow efforts at Microsoft (some already shipping and some to be revealed at PDC). Oracle (and more specifically the middleware and applications management part of Oracle Enterprise Manager) has just acquired ClearApp. The company is based in Mountain View (California) and their QuickVision product is a very advanced management tool for composite applications, especially BPEL-based and Portal-based applications. More information about the acquisition is available from this page and the press release. Information about the QuickVision product can be found on the ClearApp site. QuickVision is a very complementary addition to our existing products and the acquisitions that we have made over the last year in the application management domain. Let’s take a performance management use case to see how they relate to one another conceptually (this is not an integration roadmap, just a comparison of the features of the existing products): Oracle Real User Experience Insight (from the Moniforce acquisition) will tell you that your users are seeing a performance degradation for a specific function of your Web application. If this is a stand-alone Java application, you can go straight into the Enterprise Manager App Server Diagnostic Pack to start from a URL and analyze where processing time is spent (servlet, JSP, EJB, JDBC…). AD4J (from the Auptyma acquisition) provides deep insight into the JVM. It will give you the line number and call stack of the slow methods. For example, it might lead you to a specific database call that is taking a long time to return. You can then follow the trail deep into the database using the Oracle Database Diagnostic and Tuning packs. But if your application is a composite application (for example one that makes use of a BPEL process to orchestrate services deployed on different application servers), then you would have a hard time finding which application server to focus on. The QuickVision product fills that gap, taking a BPEL process from its invocation point into all its successive steps and into the code that the different steps invoke. So you can see if the problem is within the BPEL execution (e.g. you loop too many times) or inside an invoked Web service. In that case, QuickVision will lead you to the class that implements that service, at which point you have all the context that you need to fire off AD4J and do a fine-grained analysis of the problematic Java code as described above. A variation on this would be if the service monitored was a SOAP service as opposed to a Web page. Oracle Web Services Manager could then be used as an alternative to Real User Experience Insight to alert you that something was amiss with the application performance. The rest of the flow would be the same. At the end, it’s not just about managing Web services or Web sites, it’s about managing the whole SOA application. Of course, QuickVision is not limited to performance analysis, even though that’s my favorite feature. For example, I could have picked a dependency analysis scenario. To my new colleagues joining us from ClearApp, welcome! Let’s put aside for now all the discussions about whether BPEL is an appropriate tool to capture a “true” business process, i.e. to implement the business logic understood by a business analyst (a topic that has been discussed at length already, including here, here, here, here, here, here and around the 5 minute mark of this podcast). Today, let’s look at it as simply another resource in a developer’s toolbox, alongside things like servlets and XML parsers. It’s a tool that can simplify the invocation of remote services (especially asynchronously), the parallelization of tasks, the definition of scoped compensation handlers, the transformation of XML, the encapsulation of key business logic and, most importantly, the reliable implementation of long-lived processes. If you need a few of these features, you might find BPEL a suitable programming tool. Plus, it refreshingly encourages handling of XML as XML (e.g. via XPath) rather than mindless code generation. In addition to whatever developer productivity benefit you see in BPEL, there are other potential benefits form using it. They are the topic of this post and they relate to application management. We all know that in an ideal world, no developer would release an application without providing a set of management capabilities that are carefully crafted to reflect the business logic of the application. Such that IT administrators can monitor, configure, optimize and troubleshoot the application in ways that are related to what the application really does (as opposed to generic metrics like memory, CPU and I/O metrics…). It feeds directly from the metadata used by the runtime, so it is guaranteed to be accurate (unlike metadata that is created specifically for management but has no role in the actual runtime). It shows what external services the application depends on. Of course there is no guarantee that all remote invocation will be represented in the BPEL process, but since that’s a strength of BPEL it is reasonable to expect that it provides a good view of application dependencies (to be complemented, of course, by the application infrastructure dependencies like the database and the BPEL engine itself…). Remote invocations are a common point of failure and/or performance problems so they are a first class citizen of an application management model. It explicitly captures process instances. No more jumping from one database table to another (assuming you even know where to look) to try to get a sense of the current overall status. The BPEL instances show the number of in-flight transactions in the application. It is also easy to compare the initialization and termination rates to see the trend. It provides a horizontal segmentation of the processing tasks (via the BPEL activities) that is a good complement to the vertical segmentation often offered by application management tools (e.g. time spent in the database, time spent waiting on I/O, etc…). It makes explicit certain exception conditions. All these only make use of very basic aspects of BPEL: the enumeration of PartnerLinks, the notion of a process instance, the existence of activities, the fault/compensation/termination handlers. A fair amount of visibility into the health of the application can be derived form this alone. I am not making fancy assumptions about the management tool being able to make sense of the routing logic in the process or of the correlation rules. I am not assuming that the BPEL engine provides ways to control individual process instances. I am not assuming that the name attributes of certain elements (e.g. PartnerLink, variable) convey semantics that could help the administrator understand some of the semantics of the application. At the end, it’s not about managing BPEL, it’s about managing an application that uses BPEL. A few related links. Todd Biske has also written about the management value of BPEL, here and here. A similar analysis can be applied to SCA, but at this point in time there are many more applications out there that use BPEL than SCA, making the former more relevant. I briefly described the SCA side of the equation in an earlier exchange with David Chappell. That discussion is summarized here (including a pointer to David’s original piece). In an earlier post, I touched on the manageability potenial of other sources of application metadata, like OGSi and Spring (in addition to SCA and BPEL). Jean-Jacques Dubray provided additional context at InfoQ. BPMN to BPEL: going to battle with one hand tied? I have been looking at business process modeling and I am a bit puzzled about the connections between the different goals (strategy support, process documentation, automated execution…. ), audiences (LOB, business analysts, developers…) and tools (process editor, registry, simulation bench, IDE…). I see how it would be nice for all these to play well together. What I don’t quite see is exactly how the current tools achieve that. One example is the goal of improving communications between business analysts and developers by allowing analysts to capture as much of the intended process as possible in a way that can be easily consumed by developers. That is a worthy goal and it should be eventually achievable (though maybe in a reformulated form) based on industry trends (who would have thought that one day business people would use their own computers to retrieve business data rather than having an operator print documents for them). But it is still a very difficult goal, for which many inherent barriers (in terms of shared vocabulary, skills and mindset) must be overcome. My concern is that the current approaches add many artificial barriers to those intrinsic to the problem. One source of such artificial barriers is that incompatible business process description languages come into play. One common example is the use of BPMN for analyst-level modeling followed by a translation to BPEL for development tasks. I ran into an example of an incompatibility between the two very early in my experimentations with BPMN, in the form of the “inclusive OR” (the diamond with a circle inside in BPMN). It lets you express something like this: “The customer quote can be reviewed by the region manager, the country manager or the VP of sales. At least one of them must review the quote. More than one may review the quote”. My first thought when encountering this construct was “how does this get mapped to BPEL”, since there is no equivalent BPEL construct. After scratching my head, I could think of two ways to do it, neither of which is very pretty. One is to turn this into a brute-force enumeration of all the legal combinations (“1”, “1 and 2”, “1, 2 and 3”, “2”, “2 and 3”, “3”) which can get out of hand pretty quickly if you have more than three branches. The other relies on event handlers. In both cases, you end up with a BPEL process definition that should be correctly interpreted by a BPEL execution engine but that is hard to read for developers and almost impossible to round-trip back into a nice BPMN description. Several similar corner cases in BPMN to BPEL translations are described in this paper, in which the authors also have to resort to BPEL event handlers. You can find approaches to improve the BPMN to BPEL mapping in this paper (also check out the list of references, including this paper, for more research on the problem). This tools makes the choice to favor BPEL readability at the expense of precision. The BPEL is much nicer but it fails to capture the fact that at least one of the optional tasks must be performed (a BPEL execution engine would allow an instance to go through all three “empty” constructs, bypassing all the optional tasks). In our example, it means that the customer quote could go out without any management review, even though the business requirement is to have at least one. This is potentially worse than not allowing the analyst to specify the “at least one” business requirement: the analyst assumes that the requirement is captured (since it is conveyed in the BPMN flow) but the developer never sees it (assume the developer only gets hold of the generated BPEL). If the analyst was not able to input the requirement in BPMN, s/he would at least be more likely to add this as an off-line comment for the developer to take into account. As all the research papers I previously linked to illustrate, this disconnect between BPMN and BPEL is a known problem that people have spent a lot of efforts trying to fix. But in the absence of a satisfying solution, I keep asking myself whether this problem is better circumvented than fixed. I am not one to shy away from model translations (otherwise I would be in the wrong business) but I see model translation as a tool that can be overused. In the current state, putting my self in the shoes of a BPEL developer, I’d rather get a nice BPMN flow than a weird BPEL process that was auto-generated. I don’t have a solution to the problem. Maybe it’s to define an implementable subset of BPMN (or an analyst-friendly subset of BPEL, which may be essentially the same). Or maybe not everything goes through explicit business process modeling. The developer will need test cases anyway, so maybe the right approach is to provide a high-level overview of the process followed by a bunch of tests. I can see a system where the business process modeling engine would be used to generate test messages and the analyst would tell, step by step, what happens to each message. The UI could be designed such that the tool could know what element of the message/context the analyst observes in order to chose the next step. And a strawman implementation flow may even be generated based on how the analyst dispatches the messages. At least the messages can be used to drive unit tests. Business process analysis tools already know how to run process simulations (except they are driven by statistical rules to decide what branches are taken rather than interactions with the analyst). While doing some research on the different ways to probe and squeeze business process definitions to extract insight relevant for IT management I ran into this very interesting paper: Querying Business Processes. It defines a query language (called BP-QL) to query process definitions. Not much in common with CMDB Federation at first sight, and CMDBf was not on my mind at the time. Until I looked at the description of the query language that the researchers came up with. It is strikingly similar to the CMDBf query language. This is not very surprising since both are graph-based query languages that rely on patterns (where the patterns mix topological aspects with constraints on node/link properties). CMDBf is more complete in some respects. It supports properties on the relationships, not just the items. The “depthLimit” element provide more control than BP-QL’s double-headed edges. BP-QL has its own extra features, including support for joins (something we discussed in CMDBf and that could be added to the specification) and negation at the graph level (e.g. A and B are not connected by any relationship of type “foo”, which may be useful but one should remember that CMDB discovery is rarely guaranteed to be comprehensive so an open-world approach is often preferable). Assuming a suitable CMDB model for business processes, a CMDBf-compliant CMDB should cover many of the simpler use cases addressed by BP-QL. And reciprocally, the more advanced features in BP-QL are not really specific to business process definitions (even though that’s the scope of the paper) and could well be applied to CMDBf. I was also very interested by the BP-QL “compact representation” and the implementation choices. I hadn’t heard of Active XML before, something to look into especially if, as the paper hints, it does a better job than XQuery at dealing with idrefs. And Active XML introduces some interesting federation (or at least distribution) capabilities that are not currently exploited by BP-QL but which I find intriguing and which reinforce the parallel with the declared goal of CMDBf. Is this similarity between the query languages just an interesting pattern to notice? Or is there more to it? The parallel between BP-QL and CMDBf invites the question of whether one should model business processes in a CMDB. And if so, is a business process represented by just one CI or do you break it down into a model similar to the one the BP-QL query language works on? You would need to go that far if you wanted to use queries to the CMDB to answer questions such as those handled by the BP-QL engine. And by doing this in the context of a CMDB that contains a lot more than just process definitions, you’d be able to enrich the queries with considerations from other domains, such as application or host topology. Modeling business process steps/activities may seem like very fine-grained modeling for a CMDB, but isn’t this part of the sales pitch for federated CMDBs, that participants in the federation can provide different levels of granularity? Of course, CMDB federation might never work out. If it does work and if we use it that way, we are not talking about just supporting change management processes (which are more likely to take place at the level of the overall process definition than the individual step) but rather about management integration for a wide variety of use cases. If that means we need to drop the term CMDB along the way (and leave it for the sole usage of the IT process people), I am more than happy to oblige.